This former Russian research vessel was entirely rebuilt in Greece to stunning designs by H2 Design of London. The yacht is designed to carry over 50 passengers and is designed to comply to full SOLAS & Lloyds regulations. Trend Marine are proud to have been chosen to be the complete glazing supplier. Our supplied products ranging from complex large format curved panels, to A60 fire retardant double glazed window units. In total more than 450 glazed panels were supplied. Our engineering team were on hand to calculate and reduce glass thickness to remove the requirement for storm covers in certain areas. Temperature reduction and UV protection was also achieved through the use of insulated glazing units. 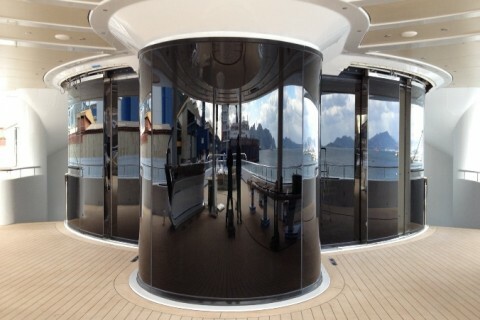 At 125m this was the largest yacht project we have undertaken to date and with some very complex curved glass we are proud to include in our portfolio. Maryah is a beautiful and legendary megayacht and we are delighted to have been a key supply partner in her development.